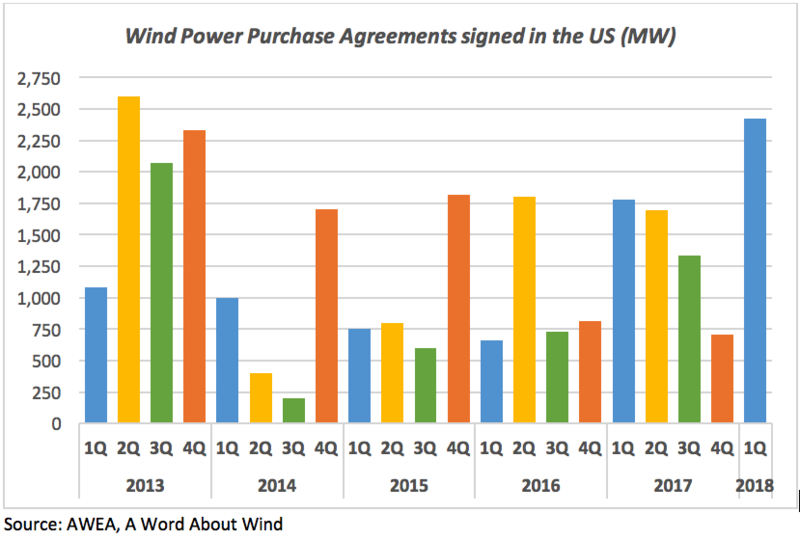 Wind farm owners concluded power purchase agreements totalling 2.4MW in the US in the first quarter of 2018, according to A Word About Wind research on reported deals. This makes the first three months of 2018 the strongest quarter in almost five years. Our latest Finance Quarterly report shows that energy buyers are committing to wind PPAs despite political uncertainty and falling wholesale power prices in the US. In particular, corporates and other non-utility customers have driven the strong result of this quarter, signing for over half of the capacity contracted (1.3GW). Utilities have agreed to buy the other 1.1GW. Major corporates including AT&T and Facebook have been among the biggest buyers of wind energy in the three months ending in March. In particular, telecoms giant AT&T agreed to purchase the total output of two wind farms, developed by NextEra Energy in Texas and Oklahoma, with total capacity of 520MW. Social media giant Facebook signed wind PPAs to buy 336MW of power produced by three projects totalling 536MW. This includes a deal to gradually purchase 120MW of wind power of the 320MW Rattlesnake Creek wind farm by 2029, in addition to the 200MW that the firm already agreed to buy from the project in Q4 2017. It is set to use the electricity to power a data centre in Nebraska. The nine corporates that confirmed they had signed PPAs included first-time buyer Jack Daniel's maker Brown-Forman, which agreed to purchase 30MW of the 474MW Solomon Forks wind farm in Nebraska. This was the first commitment to buy renewable energy by a spirits and wine producer in the US. The volume of PPA deals signed in the first quarter of 2018 shows that PPAs represent the most powerful tool that wind developers in the US have to secure construction of their projects. Despite the election of President Donald Trump and cheaper wholesale power prices, companies keep seeing wind as a strategic investment to diversify their energy portfolio and secure long-term sustainability. It is still early days but, if companies keep up this momentum, 2018 may be the US wind industry's strongest year yet for PPA deals.